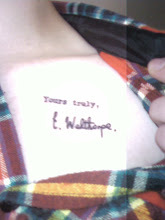 Yours Truly, Edna Welthorpe: He looked surprised and said, 'No'. 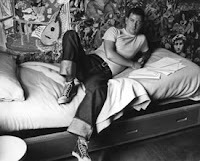 What do you know about Joe Orton? If the answer to that question is "nothing" (or anything remotely resembling it) then you have gravely deprived yourself. Joe Orton lived and died in a neighborhood in London called Islington, which happens to be where I am currently keeping myself. Aside from being a fantastically cheeky and dark playwright, he was also a mischief maker with a wit of steel and a master of promiscuity, much to the chagrin, it turned out, of his long time partner Kennith Halliwell with whom Orton shared his tiny flat at 25 Noel Road. I happened (completely coincidentally...or was it?) to find myself at 25 Noel Road today with a copy of Orton's diaries and complete works. Call me a posthumous stalker. Orton's most well-known work is indisputably Loot, which centers around a young man who irreverently disposes of his mother's corpse when he needs a place to conceal a large sum of stolen money and sees the fittest location to be the aforementioned deceased's coffin. Overwhelmed yet? It only gets better, so read it. Entertaining Mr. Sloane (currently running on the West End with Imelda Staunton and Mathew Horne) and What the Butler Saw are equally dependant on improbability and shenanigan - critics and admirers have deemed his work to be absurd but Orton insisted that he was writing real life. This is eerily apropos considering the circumstances of his own life and death. Much of the content of his writing seems to foreshadow a great deal of what actually came to unfold in his too short life. It can be presumed that, if his plays have any part of Joe Orton the man in them, he was not a bullshitter. This is supported by reading even the first page of his diaries (which everybody should do - John Lahr is an amazing editor/compiler/researcher). He is frank in his tastes and even more frank with regards to his sexual practices. After the early passion of his relationship with Halliwell, Orton hardly mentions him as an object of any affection or desire - he functioned more as an assistant to Orton as his success became more and more eminent. On the contrary, Orton conducted most of his physical escapades in toilets and "cottages" (for all of the New Yorkers reading, think Turkish Baths or Tea Houses...) or in abandoned buildings, alleys, flats belonging to men who he picked up on the streets or in parks and toilets. If you read his diary all will be explained. P.S. Especially the latter part. Damn. Orton was working on a screenplay titled Up Against It for The Beatles at the time of his death. It was never finished. Orton's funeral was attended by many friends, family, actors, writers. Only three people attended Kenneth Halliwell's funeral. He was neglected even in his last hoorah.